Home > News > Where is poor employment concentrated in England? Where is poor employment concentrated in England? Our new report on delivering the industrial strategy includes public polling by YouGov on people’s attitudes to work. We included the polling as part of the research because government has framed its industrial strategy as a plan to address the country’s lagging productivity. A large part of this means British workers doing their job better and more efficiently. Understanding what motivates people to work – pay, dignity, security – therefore seems an essential part of making the industrial strategy a success. The striking conclusion of the polling is how many people are unhappy with their quality of employment. Half of all people think they are underpaid. 61 percent do not think they are rewarded for hard ward work (the very idea underpinning the industrial strategy). 29 percent find their job unfulfilling and a third do not find meaning in their job. To find out where poor quality employment is concentrated across England, as part of the report we developed a poor employment index. The index shows the quality of jobs across local authority areas and is based on three factors: financial compensation, the skill-level of work (low-skilled occupations tend to be more physically strenuous, repetitive and are generally characterised by a low level of autonomy) and job satisfaction. The full methodology can be found on page 55 of the report. The map shows one of the key challenges for the industrial strategy and government more widely: the concentration of poor-quality employment in England’s coastal areas and urban fringes. 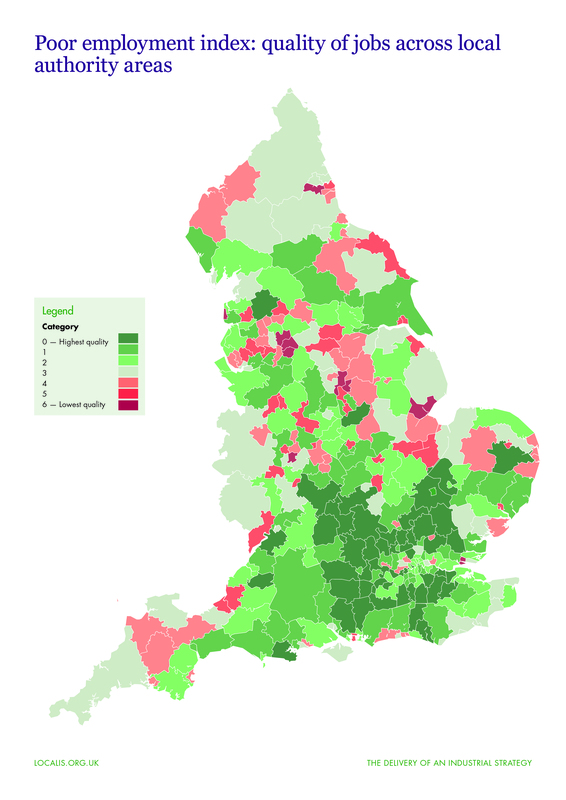 The hot spots of poor quality employment are in the Midlands and the North. England’s worst jobs are in Blackpool, Bolsover, Boston, Castle Point, Gateshead, Mansfield, Oldham, Rochdale, Sandwell and Tameside. All figures, unless otherwise stated, are from YouGov Plc. Total sample size was 1,641 adults. Fieldwork was undertaken between 21st – 22nd February 2018. The survey was carried out online. The figures have been weighted and are representative of all GB adults (aged 18+).